"... it's not a shock, it's a trauma," said San Juan Mayor Carmen Yulin Cruz. For over 16 hours on Sept. 20, 2017, an island of more than 3 million people was battered by the Category 4-hurricane-force winds and rain of Maria. The toll taken on Puerto Rico became evident immediately: total destruction of an electrical grid and telecommunication services, and an economic cost of nearly $140 billion. But it was the human toll that took the longest to grasp. "I said we all have some sort of PTSD. It's a trauma. It's not, it's not a shock, it's a trauma," San Juan Mayor Carmen Yulin Cruz told ABC News on Wednesday. (Gerald Herbert/AP, FILE) The rubble of homes is scattered in the aftermath of Hurricane Maria in Toa Alta, Puerto Rico, one week after the storm hit, Sept. 28, 2017. Death by heart attack, flying debris, suicide -- those were among the earliest causes after the storm. Outflows of information became close to impossible in the days after the storm, yet anecdotes of those who died reverberated across the island. A month after Maria, the government reported the death toll at 51, acknowledging that there had been more than 900 cremations on the island after Maria. The following months saw a flurry of academic and journalistic reporting that showed the death toll was in the thousands. Nearly 11 months after the storm, an independent study from George Washington University reported that an estimated 2,975 had died after Maria. The report's findings were accepted by the Puerto Rican government, which revised its death toll from the storm up from 64. The report was criticized by President Donald Trump, who on Wednesday said that Hurricane Florence was "one of the wettest we've ever seen from the standpoint of water" and who tweeted after the independent report on Puerto Rico was released, "3000 people did not die," based on no evidence whatsoever. "When I left the Island," Trump's tweet continued, "AFTER the storm had hit, they had anywhere from 6 to 18 deaths. As time went by it did not go up by much. Then, a long time later, they started to report really large numbers, like 3000." The president added, "This was done by the Democrats in order to make me look as bad as possible when I was successfully raising Billions of Dollars to help rebuild Puerto Rico. If a person died for any reason, like old age, just add them onto the list. Bad politics. I love Puerto Rico!" Cruz, who has sparred with the president over the federal government's response to the storm, called his remarks "unhinged," adding, "He has a total lack of touch with reality. ... What did he think he was going to gain by continuing to politicize this? You know this is not about the president." More than 130 lawmakers sent a letter to Trump a day before the anniversary of the storm’s landfall, calling his comments "grossly inaccurate, callous, embarrassing and beneath the dignity of the Office of the President of the United States." The lawmakers added: "You sought to distort the truth and, in doing so, gravely insulted the mourning families of the thousands of American citizens who died from Maria and the storm's aftermath." 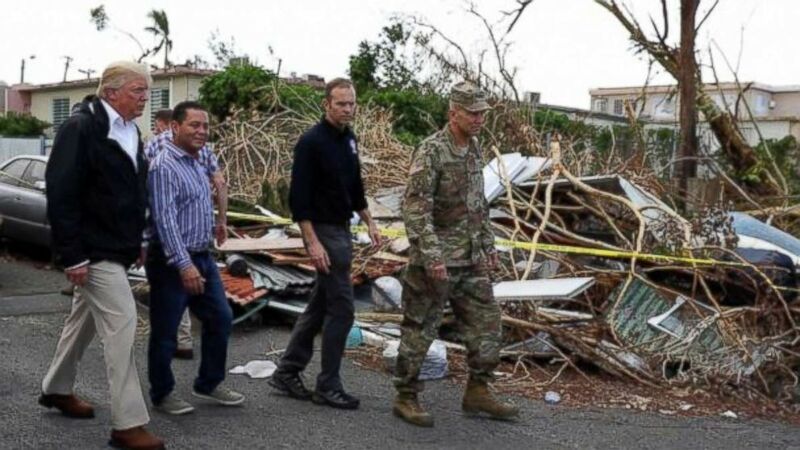 (AP) FEMA administrator Brock Long, second from right, with President Donald Trump and Lt. Gen. Jeff Buchanan, right as they toured an area affected by Hurricane Maria in Guaynabo, Puerto Rico, Oct. 3, 2017. Following the president's tweets, Gov. Ricardo Rossello said, "The victims in Puerto Rico, and the people of Puerto Rico, do not deserve that their pain is questioned." "This is not a moment to fight, or to make political noise, or to use this to benefit one side or another," Rossello added. "This is a moment to remember all those that lost their lives. It is a moment to recognize their pain and sacrifice that all have made for the recovery efforts." 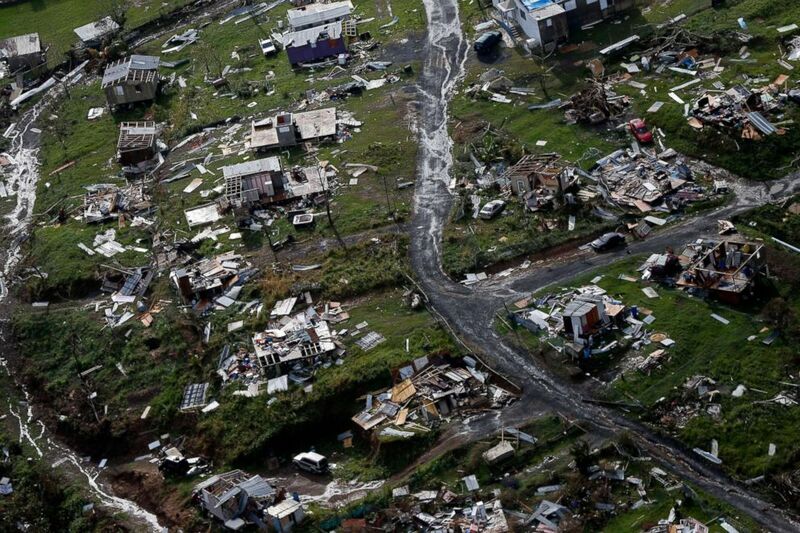 In a statement referring to its study of the death toll after the storm, George Washington University said: "We stand by the science underlying our study, which found there were an estimated 2,975 excess deaths in Puerto Rico after Hurricane Maria," adding, "This study, commissioned by the Government of Puerto Rico, was carried out with complete independence and freedom from any kind of interference." "The duty that every government has is doing the simplest task to make sure that people live," said Cruz, thinking back to the president's October trip to Puerto Rico. "When I met him, I shook his hand and said, 'This is not about politics sir. It's about saving lives.'" The anniversary of the storm will be marked throughout the island with ceremonies to remember the death and to celebrate those who survived. The main commemoration will take place this afternoon in San Juan. Today "will be a day of reckoning, a day of understanding, a day of sorrow," Cruz said. "But it will also, I think, I hope, it will be the beginning of starting anew." ABC News' Lynda Lopez and Ignacio Torres contributed to this report.